Israel has repeatedly attacked UN facilities and workers, and it's blatantly obvious that these aren't just accidents. Israel doesn't want the international community to be in Gaza to see what is really happening. Israeli forces bombarded and then entered the Gaza Strip's main city early Thursday, firing shells into at least three highrise buildings and the United Nations headquarters there, according to UN officials and witnesses. 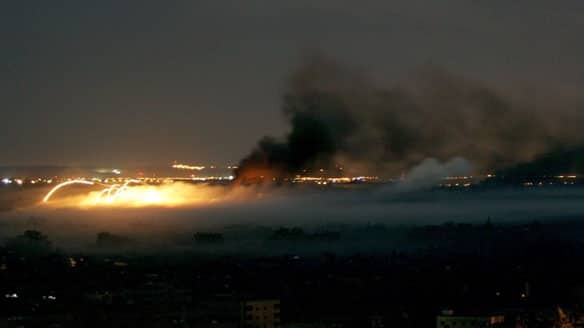 The UN compound, which was providing refuge to about 700 Palestinian civilians, was on fire and engulfed in smoke after the attack. Three UN workers have been injured, spokesman Chris Gunness said. The civilians have been moved to another area of the compound and are not in immediate danger, according to a BBC report. Large amounts of aid supplies, as well as fuel trucks, are at risk of being destroyed, Gunness said. The UN compound includes the headquarters of its agency for Palestinian refugees, the United Nations Relief and Works Agency (UNRWA), as well as a school and other offices. The UNRWA has suspended its operations inside Gaza as a result of the attack, according to reports. The latest attacks took place Thursday in a crowded residential area on the edge of the city and mark the deepest incursion into Gaza City yet for the Israeli military, which declined to discuss the operation. Troops backed by helicopter gunships, tanks and heavy guns were in pursuit of Hamas militants in the Palestinian territory, according to the Associated Press. More than 70 air strikes were launched overnight, including one on a mosque suspected of containing weapons, the BBC reported. At least 15 rockets were fired by Gaza militants into southern Israel. The Israeli attacks forced thousands to flee their homes, according to Palestinian witnesses. Some residents were reportedly on the run in their pajamas, while others steered elderly parents in wheelchairs. Israeli forces had surrounded the densely populated city in recent days, with some tanks and troops occasionally moving deeper into the central neighbourhoods. The developments in the 20-day-old military conflict came as UN Secretary General Ban Ki-moon was in Israel trying to promote a ceasefire. Speaking in Jerusalem, the UN chief expressed "strong protest and outrage" over the attack and immediately demanded an investigation. Ban said Israeli Defence Minister Ehud Barak has told him it was a "grave mistake." Ban also said the death toll in Gaza has reached an "unbearable" level. The latest attacks also came after Palestinian militant and political organization Hamas announced it had accepted an Egyptian ceasefire proposal "in principle." Lead Israeli negotiator Amos Gilad is expected to arrive in Cairo later in the day to meet with Egyptian mediators and provide Israel's response to the truce proposal. Egyptian Foreign Minister Ahmed Aboul Gheit said he would pass on Hamas's position to Israel on Thursday, and that Hamas has responded "positively" to his country's peace initiative. After Wednesday's talks, Hamas official Salah al-Bardawil told reporters his movement presented a "detailed vision" to the Egyptian leadership of Hamas's ceasefire demands "to end the aggression and lift the injustice on our people in the Gaza Strip." The specifics related mostly to the reopening of border crossings into Gaza under international supervision. Hamas has repeatedly said that any truce agreement must also include terms to end Israeli attacks and see the complete withdrawal of troops from the Gaza Strip. Israel has said it will not agree to a truce that would allow Hamas to regroup and replenish its rocket arsenal through smuggling tunnels under its border with Egypt. "Israel seeks a durable quiet that contains a total absence of hostile fire from Gaza into Israel and a working mechanism to prevent Hamas from rearming," said Mark Regev, a spokesman for Prime Minister Ehud Olmert. United Nations Secretary General Ban Ki-Moon is also scheduled to meet Thursday with Israeli leaders to push for an end to the conflict. As diplomatic efforts continued on Wednesday, the Hamas-run Ministry of Health in Gaza said that the death toll in Gaza topped 1,000, and that civilians accounted for half the fatalities. The Gaza casualty reports are nearly impossible for media organizations to confirm as Israel has barred foreign journalists from entering the coastal territory. Thirteen Israelis, among them 10 soldiers, have been killed since the military campaign started on Dec. 27. Israel says its military offensive is aimed at bringing an end to Hamas rockets fired from Gaza into the Jewish state's southern towns, and it accuses the militant group of using civilians in Gaza as human shields and exploiting civilian casualties for political purposes. Despite a significant drop in rocket fire, Palestinian militants still launched at least 14 rockets at Israel on Wednesday, the Israeli army said.